Doing Your Own Plumbing? Skip the Fire. 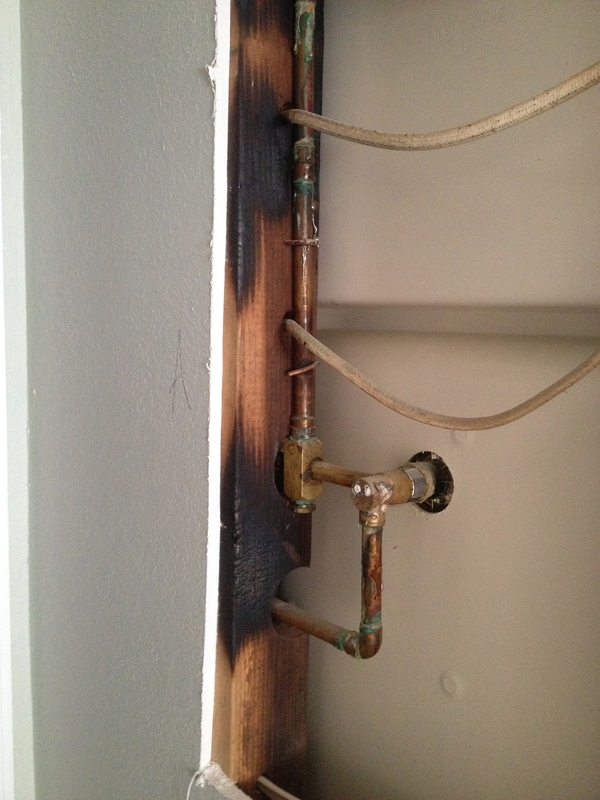 Do your own plumbing, just don’t do it like this. Sweating copper is crazy. Not just because it takes so much fire but because it’s a practiced art. It’s like making beer, playing the guitar or throwing a frisbee into the wind. It’s not something you do well the first time you try, and it sure helps to have some guidance from someone who knows what they’re doing. That’s why I don’t sweat copper, or, make my own beer. Professional plumbers do it all the time. Sweat copper that is. They know how to get enough water out of a wet copper pipe to get the job done. They know how to cut, ream, scuff, flux, assemble and finally solder a joint with a water tight seal the first time. They know when and how to take things apart so they don’t melt the parts inside when they heat things up to sweat solder. They know these things because they’ve done it a thousand times. They probably also worked for someone who got them off to a good start when they were new at it. If you want to be a professional plumber, go for it. If you’re adding a bathroom to the basement or replacing a bath faucet in the house you may not have years of time to gain the needed experience. Here are some ideas for getting it done without all the fire. If your house is old enough to still have galvanized supply lines, skip this step and go on to the “re-plumb your whole house” section. If your house has that grey poly-butyl from the 1980’s do the same. Most likely your house has copper plumbing or PEX plumbing, depending on the age of the house. While copper has been the standard for decades, PEX is filling the market now. If your house is full of copper, fine. Don’t worry. For the most part it’s long lasting and doesn’t have too many issues. Now say you’re doing a project on your own. Skip the torch. It’s a headache and a fire hazard. Learn to use Sharkbite fittings and PEX materials. Sharkbite fittings slide onto copper and PEX with no glue, crimping or solder. They work great and can be taken apart easily for adjustment with a simple tool. They also are pretty expensive. I use a couple Sharkbites to attach to the hot and cold copper then I run PEX from there. PEX is a flexible polycarbonate material that bends, resists splitting when frozen and pulls through house almost like wiring. It comes with all kinds of elbows, couples, t’s, shutoffs and other fitting to do almost any plumbing job. The tubing is cut with a pair of plumbing shears or even pruning shears. The kicker is the crimping tools. They’re expensive. I’ve got a pair of 1/2″ and 3/4″ but even used they were a little pricey. I tried the cheap ones you squeeze with pliers in the plumbing department at the store. They didn’t work so great. That’s why I bought the real ones. Luckily the crimp tools can be rented at most home improvement stores or a rental store. You can also rent a “band cutter” to remove bands when you change your mind. It’s worth it, those bands are hard to remove any other way. PEX handles so nicely the job goes pretty fast. The stuff is so forgiving to work with your anxiety level and frustration will be almost null. It’s almost fool proof. I’ve had only one band leak during ten years of installing the stuff. When I remodeled our own bathroom several years ago I used PEX. We have a pretty small bathroom but still managed to stuff a standing shower with a sitting bench, and a soaker tub back to back in the little bathroom along one wall. In the shower we have three shower heads, a shower faucet with diverter, a steam controller and steam inlet. I installed the steam generator inside the bench. In the same dividing wall facing the tub we have a faucet, tub spout and spray wand. Because we built a glass panel into this dividing wall there’s a lot of plumbing packed into a tight space. It’s all PEX. In fact so much of it the project looked like a schematic when the plumbing was done. The wall was so full of plumbing and so slender I had to build it with plywood, cabinet style to fit it all in. I even placed one of the shower heads in the wall of the shower that houses a pocket door. Don’t ask. I don’t think copper would have even worked. First of all the PEX flexes, that allowed the lines to move past one another in less that perfectly straight lines. Second, I would have burned the wall to the ground and the house along with it trying to sweat all those joints. PEX made the project possible. Check out your favorite home improvement store. Get familiar with the PEX materials. You’ll be surprised at the simplicity and effectiveness of the PEX products. You’ll feel empowered to take on that next project without the frustration of sweating copper with fire. You’ll be glad. Still don’t think you want to mess with plumbing, that’s fine. Call your favorite local plumber. Chances are they’ll sweat a fitting onto your copper lines. It’ll be watertight the first go-round. They might use a Sharkbite instead. But most likely the next thing they’ll pick up is their PEX tools. It’s just that easy.